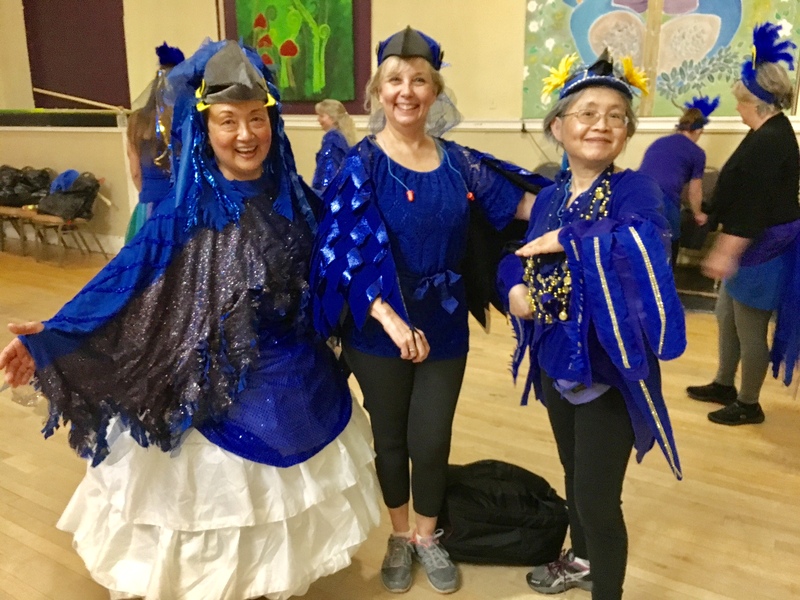 As the annual Procession of the Species in Olympia draws nearer, there is one unmistakable dance troupe that’s hard at work channeling their inner parrot. Or, to be more specific, their inner hyacinth macaw. 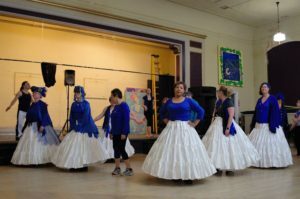 Samba OlyWa, the amateur percussion and dance group, has made an indelible mark in Thurston County for more than 20 years. With humble beginnings in 1994, Samba OlyWa has grown from a small drum and dance ensemble to an all-inclusive community that seeks to create a fun, welcoming space for people from all walks of life to come and express themselves. The samba group is led by a seven-member steering committee and performs several times a year throughout the Northwest, including at the Fremont Solstice Parade, Capital City Pride and Brazilfest, just to name a few. But there’s no denying the biggest event of the year is the annual Procession of the Species that takes place every spring, attracting dozens of new and repeat community members. According to their website, the Procession of the Species aims to connect communities with the natural world, allowing participants to express their full creativity in larger-than-life costumes, gigantic puppets and floats, and celebrate the elements of Mother Earth – earth, air, water and fire. Samba OlyWa has not missed a Procession (nor repeated a species) since its inception and has most definitely become a local favorite. Carol Riley has been a Samba OlyWa dancer for 17 years and currently serves as the Costume Chair. She says costume ideas are narrowed down in accordance with the parade elements, but are ultimately left up to a full-membership vote. Past favorites have ranged from zebras, tigers, octopi, butterflies, sea stars and bumblebees. This year’s element is fire, and the committee has selected a noble species to honor – the endangered hyacinth macaw. The macaw boasts a stunning plume of cobalt blue over its entire body with a ring of bright yellow around its eyes. One committee member remarked that it’s the species with great colors that always make for the best costumes and leave a lasting impression at the parade. 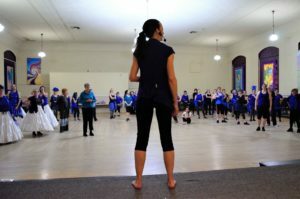 Jody Shurbier, lead dancer and samba member since 2013, says once each species is chosen, a speaker is brought in to educate and enlighten the group in hopes of then spreading that knowledge to the community. The committee hopes to bring awareness to such creatures through their performance and is currently in the process of setting up a donation fund for the endangered Brazilian bird. 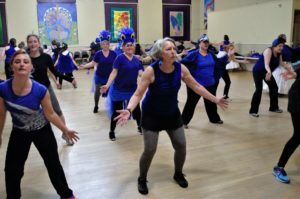 Long-term samba and steering committee member, Juli Kelen, echoes Jody’s sentiments, adding that one of the most important aspects of the group is to create a deeper cultural understanding of the dance and its history. Samba, often called Samba Rio or Samba Carioca, was a rhythm developed in Rio de Janeiro in the early 20th century and blends influences from African, European and Brazilian dance. Each year, the group brings in trained choreographers from all over the world, some hailing from Seattle, California and South America, to teach a custom dance in line with the chosen species. This year, expect arms imitating wings, lots of feathers with intricate headdresses and some occasional squawking. 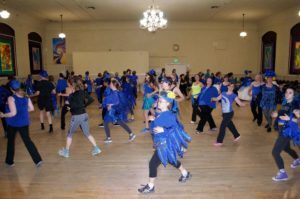 As the dancers gather on their second-to-last practice at the Eagle’s Ballroom dance hall, loud drums bang in an exciting rhythmic four-beat measure. Bodies dressed in blue move wildly, and there is a sense of freedom and uninhibited creative expression amongst the members, making it easy to see why people keep coming back year after year. What seems to set Samba OlyWa apart is the sense of community it provides and acceptance of all who wish to participate. While the dancers and drummers are made up of mostly women, the members tout that all are invited and encouraged to participate. Procession practice season begins in late winter and goes through mid-April. While it may be too late to join the Parade this year, anyone interested is encouraged to check out the group’s website and social media pages to find out how they can get involved. This year’s Procession of the Species will take place Saturday April 28 at 4:30 p.m.